What is in the products we use everyday? What about the environment around us? Cleaners, soaps, soil, pesticides, the air we breathe-what dangers and benefits are unseen? Well, that is exactly what the Environmental Working Group, or EWG do. They do what few organizations do: educate the public about some of the most common elements we encounter in day to day life. Non-partisan and non-profit, the EWG actually care about the health of the public. Founded in 1992, the EWG is more important as ever, especially as the state of the environment becomes more and more of a pressing issue. If you have ever purchased health-conscious, environmentally friendly products, you may have seen the little green ‘e’ on the bottle or package. This means that the product is verified ‘green’ by the EWG. It isn’t easy to be certified to be able to put the mark on a product. Companies have to list all of the ingredients, including details of how their product was made. The EWG mark is relatively new, started in 2015, so products that are EWG verified are beginning to become more commonplace. Look closer at the environmentally friendly products you buy, the EWG label is one of the best they can have. Unfortunately, not all the products you buy can be 100% natural and safe. However, EWG created something called Skin Deep-which, contrary to its name, goes beyond the surface of products and the ingredients in them to show you what’s really dangerous and what isn’t. Skin Deep is a database for almost 70,000 cosmetic products. 70,000! Considering most people know hardly any chemicals or ingredients found in the average product, that number is truly amazing. The most common ingredients and products have detailed and easy to understand descriptions and are graded on a 1-10 scale of how hazardous they are. Simply putting an ingredient into the search bar shows everything you need to know about it. EWG and the Skin Deep database are true proofs that green leaves are far better than those with faces on them. 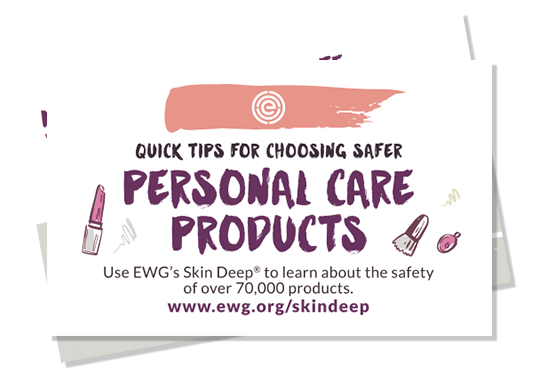 Sign up today to get a downloadable PDF version of EWG’s Quick Tips for Choosing Safer Personal Care Products – delivered right to your inbox! This entry was posted in Blog and tagged Environmental Working Group, EWG Skin Deep, Skin Deep. Bookmark the permalink.